by permission. All rights reserved. I have a lifelong interest in the natural world, particularly birds; and I'm very aware of the responsibility we have to protect and preserve the living creatures with whom we share it. I have been watching birds since childhood, and from the age of 16 I trained to become a licensed bird ringer, a hobby which I continue today. Life took me from my early passion for ornithology into other directions; but I have spoken and written about the interplay between science and faith in many different forums. Living in Somerset has given me the chance to get involved with a number of specific conservation projects, mostly in partnership with the RSPB, and this in turn has led to the opportunity to speak about these in schools and at local conferences. Cranes are magnificent birds; 'medieval herons' as I heard them described recently by a fascinated onlooker. 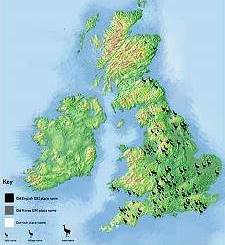 Once common throughout the UK, scores of places up and down the country are named after their former population of cranes. 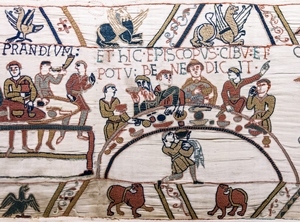 But cranes are large, standing up to four feet tall, and roast well; we know that the Iron Age inhabitants of Glastonbury Lake Village ate them, and we know that in 1251 King Henry III hosted a Christmas feast at which 115 cranes were served. King Henry was not alone in his taste for crane, and by the 17th century the crane was extinct in this country. In recent years, however, a small colony has established itself in Norfolk, and 2010 saw the start of an ambitious project to bring them back to the South West. Over a five year period, 93 common cranes were hatched from eggs donated from Germany, reared at Slimbridge WWT and released onto the Somerset Levels. Eight years on, the birds now breed across the South West, with 18 youngsters added to the release flock since 2013, and a total of 22 pairs attempting breeding in 2018. The cranes are regularly monitored, identifiable individually by their coloured leg rings and in some cases by satellite radio tags; and it has been my privilege, working as part of a small team headed by Damon Bridge of the RSPB, to ring the first of the new generation of wild cranes. This involves lying in wet ditches waiting for the dawn, and sprinting in wellies; it's magical to hear a moor gurgling into life as the sun peeps over a pink horizon. 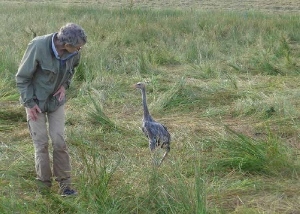 The young crane is fitted with a numbered ring and a coded set of lightweight plastic rings, and released back to join its parents. Cranes are fascinating birds. They live for up to 14 years, pair for life and display to one another in a dancing display, and produce a unique bugling call which can be heard up to three miles away. In the winter they come together in flocks, splitting into pairs and establishing distinct territories in summer. They feed on the unimproved grasslands and winter stubble fields of the Somerset levels and moors, and roost in pools of shallow water and reedbeds. 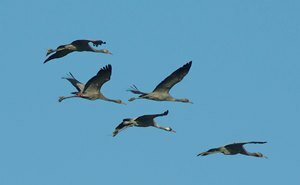 To find out more visit the Crane Project website, which explains how the cranes were reared and gives a wealth of information about the species and its history. To listen to cranes calling to one another click here, and to watch them dancing click here. 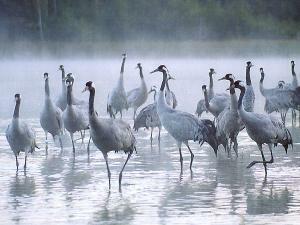 To watch a short video about the Crane reintroduction project click here. For cranes, it's been a matter of bringing back birds which we had lost; the next project has been about welcoming a species which is colonising the UK for the first time: the great white egret. Once killed for their magnificent bridal feathers, thought ideal for the decoration of ladies' hats, the egret family declined in numbers across Europe during the nineteenth and early twentieth centuries. But fashions changed, protection measures were put in place, and the climate warmed. 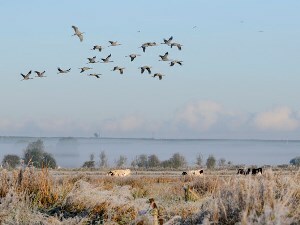 As a child I watched the little egret spread from its European stronghold into East Anglia and then gradually across England, and over the last twenty years it has been followed by its larger cousin the great white egret - which bred successfully for the first time here on the Somerset Levels in 2012. Wanting to find out more about how best to welcome and safeguard these magnificent white herons, we have started a ringing study programme to see what we can find out about this new UK species. Over the last few years a team of volunteers have watched over the first nest sites, monitored the behaviour of the breeding birds, ringed some of the first chicks and kept records of their dispersal. This has involved drones, kyaks, and hours of patient observation. In 2017 14 chicks fledged from 7 nests. At first sight it's just white. But the bird has many ways of making white into a statement. Breeding adults acquire vivid green skin around the base of their bills, and their reedy legs turn a deep and impressive red. Over its workaday plumage the bird grows a bridal gown of loose feathers which can be raised and lowered in display. Pairs build stick nests on rickety reed platforms, and lay four brilliant blue eggs; typically two chicks survive, and two ringers paddle carefully into the swamp in the early morning to ring them. In the first ringing year the birds hung around, but in 2017 two chicks from a single nest grew up, squabbled a bit and then departed on the first west wind for Kent, where they were sighted at Dungeness and Sandwich Bay respectively. Two of the 2018 fledglings have been reported from Slimbridge in Gloucestershire and Titchwell Haven in Hampshire. Other young birds have been seen all over the South West, and great white egrets are now regularly reported in winter all over the country, with breeding also confirmed in Norfolk. 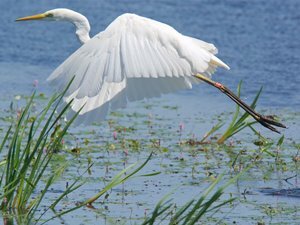 If you see any colour ringed great white egrets you can report them here! 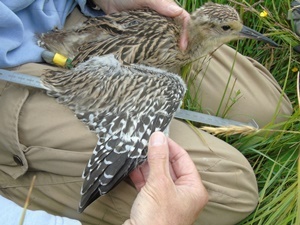 The third project, running in different forms all over the country, concerns the curlew, a breeding bird of the moors and uplands, and now regarded as the most pressing bird conservation priority in the UK. One third of the global breeding population makes its home here, and we have lost nearly half of the breeding population in the last twenty years; some studies suggest there may now as few as two hundred breeding pairs in the whole country. Curlews still breed on West Sedgemoor, and in 2017 MSc student Leah Kelly followed the fortunes of several pairs which nested in the species rich haymeadows of the northern part of the RSPB reserve. Nests were located and chicks fitted with rings and radio tags, which enabled us to recapture them every five days to check on their progress and monitor their growth. Most of the nests were predated, probably by foxes; but we think about 15 pairs produced 8 young between them. Leah is continuing with a PhD, part of the national effort being put into finding out the key factors in safeguarding the breeding population of this iconic bird into the future. The bubbling of curlews over the moors is one of the quintessential sounds of England, and our lives are immeasurably enriched by it, and by them. Listen to it here! With thanks to Damon Bridge, Beate and Eberhard Blahy-Henne, Amy King, Richard Archer, and the team of which I am part, who give their time to observing, counting, protecting and monitoring these rare species. 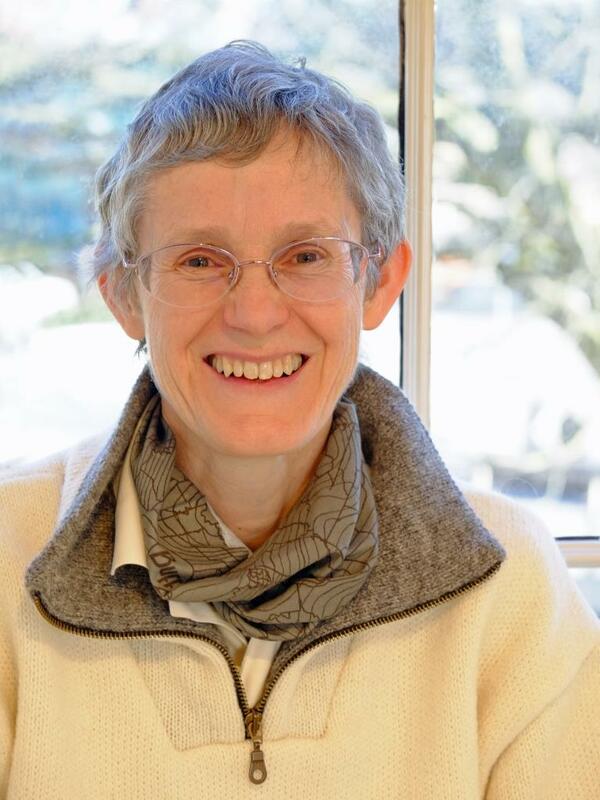 Isabella Tree - Wilding: The Return of Nature to a British Farm (Piccador 2018) - for an extract on 'the value of nature' click here.